Because I'm incredibly awkward and simply can't skip to the next book in the series, I have re-read this book for review purposes and to calm whatever OCD I have about series. Scott Westerfeld is possibly my all-time favourite YA author. I love the Uglies series, which is the series that got me into reading YA books on a regular basis and enhanced my love of reading. 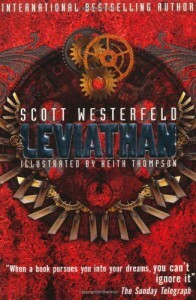 I originally read Leviathan while at school and it was actually the first book that I eagerly waited for its release; I borrowed it from the library and asked the school librarian if she could get the second book in, but I don’t know if she ever did (either way, it’s too late now because I left school two years ago). I'd spent months and months trying to find the series in bookshops and once I found it, bought the whole series since I can’t just buy the rest of the series without the first one and had to remind myself of what happens in the first book before continuing on in the series. Man, did I forget how awesome Leviathan is.